Free hosting, automatic distribution, easy monetization. It only takes a second to import your episodes; no manual uploading required. This way, your listeners will be able to hear your new episodes. This won't impact your existing listing, reviews, or subscribers. Start making your future episodes with Anchor. Either upload your audio as-is or use our built-in tools to edit. Anchor is the solution I've been waiting for! It removes so many steps in the podcast process and makes things super-easy. I am so thrilled with my choice to switch to Anchor. The thing that really surprised me was how intuitive and easy to use the platform is. I searched all over the internet for something that lets me post a podcast quickly without jumping through hoops. I’ve tried many other providers and they would charge me for every MB I loaded. Anchor is free AND so easy to use AND great quality AND amazing customer service. Why would I ever host my show anywhere else? Is Anchor really free? How is that possible? We don’t believe in charging creators to store their work. Our platform helps podcasters monetize their work, and we take an industry-smallest cut of the revenue to make sure we can keep building the best product possible, for free. Who owns the rights to my content if I use Anchor? How exactly does distribution work?
. All it takes from you is one click; we handle everything else. For any platforms where you already have a presence, we’ll link those accounts to make sure there are no duplicates and your fans won't see any changes. Prefer to manage your RSS feed and handle distribution yourself? No problem. Our One-Click Distribution is completely optional. What if I change my mind about switching to Anchor? Importing your episodes to Anchor doesn't affect your RSS feed; the switch only happens when you redirect. So you'll have plenty of time to click around and make sure Anchor is the right platform for you before officially switching. And, if you find that Anchor isn't as amazing as you thought it would be, you can easily switch back at any time. Will my podcast be unavailable during the switching process? There's zero down time during switching. Redirecting your feed from your old host to Anchor is instant, so you don't have to worry about anyone being unable to access your podcast. The whole process of switching will only take you a few minutes and it happens completely behind the scenes, so it won't have any impact on your listing or your subscribers. Do I have to use Anchor’s creation tools or can I upload my own finished audio? If you want to produce your show using another app, feel free to do so! 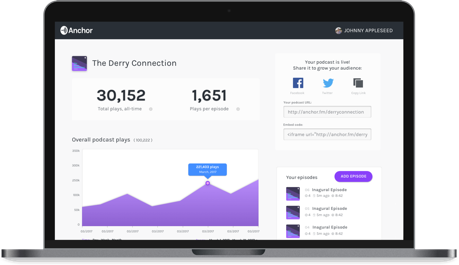 You can upload your own audio to Anchor directly from our website or mobile apps and still take advantage of our free hosting, monetization, and more. What kind of enterprise solutions do you offer? to hear how we work with larger companies and organizations. We're looking forward to helping you out!